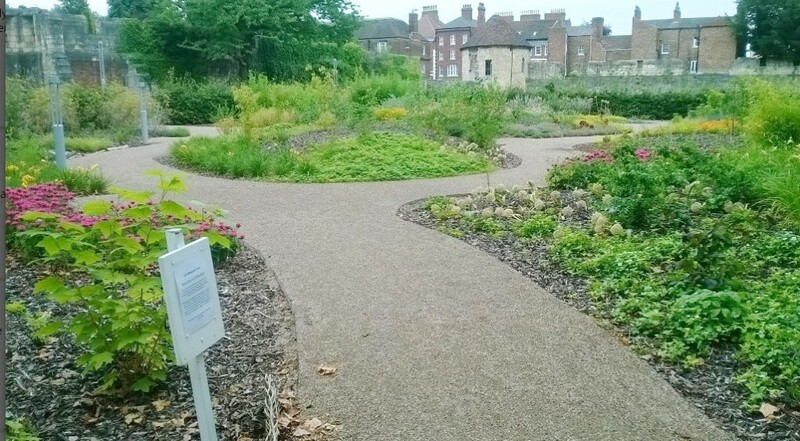 The Edible Wood is located in the York Museum Gardens and was planted in July 2015. The design of the Edible Wood is based on the principles of permaculture and forest gardening, exploring our relationship with food and the future of crop production. It features plants that have an edible component and are both attractive and useful – valuable qualities as home gardens become smaller and people search for multi-functional plants. When mature, the garden will have an intimate, enclosed atmosphere with small, light-filled glades and serpentine paths meandering through. A garden for exploration, full of unexpected flavours and hidden corners. The wonderful array of trees, shrubs, herbaceous plants and bulbs includes unusual species such as Japanese Raisin Tree (Hovenia dulcis) and Szechuan Pepper (Zanthoxylum simulans) alongside more familiar herbs, fruits and vegetables (Mint, Marjoram, Thyme, Redcurrants, Rhubarb, Sea Kale, Jerusalem Artichokes). The garden contains many different types of Ornamental Onion (Allium). These hardy bulbs are a great addition to any garden, being attractive and easy to grow with edible flowers and leaves. The Medlar (Mespilus germanica) is a small tree closely related to the Apple. Its fruit is only edible when allowed to rot slightly, a process known as ‘bletting’. It was a popular fruit in Elizabethan times. Please take inspiration from the garden but leave the produce for everyone to enjoy. Do bear in mind that some plants need to be cooked before they are eaten and even edible plants can have poisonous parts, Rhubarb and Potato being good examples. The Edible Wood was funded by Yorventure – click here to find out more about them. Click here to see a gallery of images of the Edible Wood.